“Had his mount not lost its shoe on the return journey to London, Atlas Catesby would not have been in a position to purchase another man’s wife.” Thus is Atlas Catesby, younger son of a newly titled baron, thrust into a situation ending in murder. Atlas and his friend, the Earl of Charlton, are stopped at an inn when a gathering in the courtyard gets their attention. Godfrey Warwick, a local businessman, offers his wife for sale. Atlas is shaken by her plight and inadvertantly makes the highest bid. There’s a mystery about Lilliana Warwick besides her cultured voice. Why does she wish to return to a man who’s degraded her by selling her like an unwanted mare? Answer: Lilliana doesn’t want to leave her children. “‘By law you have no right to them now that I’ve cast you out,’” Warwick informs her. Atlas makes the mistake of replying with what can only be a threat: “I’ll see you dead before I allow Mrs. Warwick returned to you.’” Those words will come back to haunt him, for during his attempts to help her, Atlas discovers an unnerving attraction to Lilliana. The next day, Atlas receives a letter from Warwick, revealing he’s had a change of heart: They can come to terms . . . for a price. When Atlas arrives at Warwick’s shop, events have taken a deadly turn. Godfrey Warwick has been murdered. A witness states he heard Atlas’ threat. He also claims to have discovered Atlas and Lilliana in a compromising position. Facing arrest, Atlas must clear his own name and find the real killer. His attempts uncover a number of unexplained facts as well as some family secrets—and many people have reasons to wish Warwick dead. What’s the mystery behind John Warwick’s wife’s death? What is the relationship between Lilliana and the Duke of Somerville? Why was Warwick blackmailing Kirby Nash, a tailor? There are too many secrets and too many motives. It’s a good thing Atlas has a knack for unraveling riddles and solving puzzles, for he’ll need all his mental expertise as well as his observational skills to solve this problem—his life, Lilliana’s welfare, and several reputations hang in the balance. Most Regency stories are delightful, and Murder in Mayfair, though it deals with a grisly subject, is no exception. The positive and negative manners and modes of the day are well expressed, as in the legal inequality where marriage is concerned. Methods of social behavior now acceptable in contemporary society also place several characters not only in jeopardy of losing status but of imprisonment and death, giving the story a widely diverse group of suspects. Full of that witty dialogue one expects from this genre, the novel has some delightful characters from the adventurous Atlas, to his friend Charlton, who may or may not be secretly in love with Atlas’ married sister, Thea, if his behavior around her is any indication. One complaint is the continual mention of two events with no true explanation. The death of Atlas’ sister Phoebe is often brought into conversation, with no backstory, as if the reader should already be aware of it and its import. Only much later in the story does Atlas speak of it in its entirety. How he was injured is never fully explained. Though this discrepancy doesn’t spoil reading pleasure, it does present a few irksome moments. 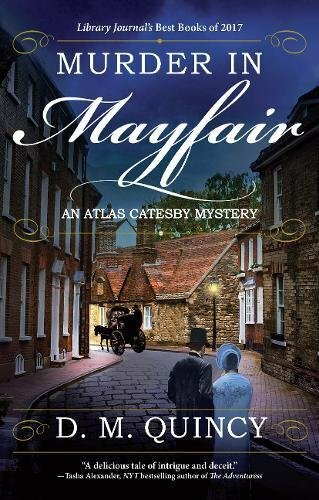 As the first in a new series, this novel makes a successful start to Atlas Catesby’s crime-solving adventures.